I am blogging with heavy eyelids now, so please excuse any incoherence. I haven't posted in a few days... I've been really busy with work stuff, but I've also been writing letters! Woo-hoo! Here is another deco tape border with some vintage stamps. 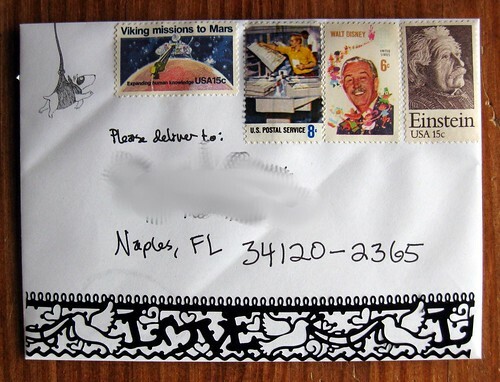 The envelope flap required securing of some kind, because the Edward Gorey stationery oddly doesn't come with any envelope glue. 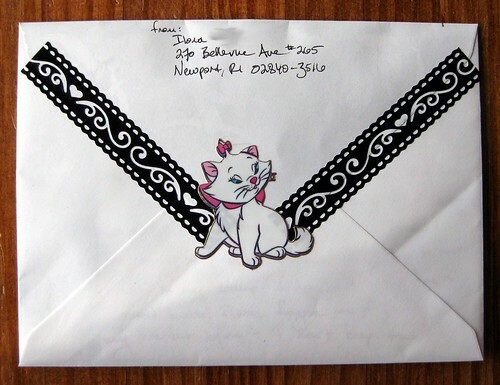 So Marie the Disney cat helped hold down the flap on this letter. 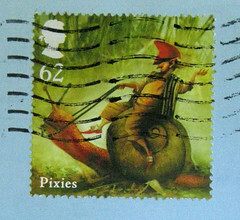 I love the disney and einstein stamp gotta love those vintage stamps . Wow at the rate you are writing all these letters and postcards you will have well over 100 by April 1st! I also love the Disney and Einstein stamps! And the deco tape borders are very beautiful! Ooh, I love this. What a great idea! So striking.